If it were up to me, I would wear jeans and Red Sox T-shirts all the time. When it gets a little chilly, I can put an old flannel shirt on top of that. And maybe when I’m visiting my family in Pennsylvania an Iron Pigs T-shirt, but basically just jeans and Red Sox T-shirts. I’m probably wearing that right now. So I was filled with tremendous anxiety and consternation when we approached the beginning of January. I had to fly to Portland, Oregon, for the National Opera Association convention, which would require wearing “nice clothes” all the time. From there directly to New Orleans for the Tribute to the Classical Arts banquet at the swanky Hotel Monteleone, a surprise visit to our biannual Faculty Institute at Xavier, and a handful of meetings at Longue Vue and the Jefferson Performing Arts Society—all of which would also require wearing “nice clothes.” An entire week of dressing up. No jeans, no T-shirts! Tensions were high. Shirts were carefully inspected. Pants were selected cautiously according to rigorous standards. Meredeth coordinated ties, exhaustively detailing which could be worn with what, for whom, and when. Contingency plans were crafted for the inevitable dumping of salsa all over myself, which happens even more often than you already think it does. I purchased some sort of bizarre, clothes-folding, storage contraption at the Container Store, and spent several long hours trying to decipher the mysterious instructions on how to fold a shirt, which seemed to be printed in an elaborate new system of hieroglyphics. Finally the suitcase was packed, trampled down, and after some intense physical exertion, zipped up. I was prepared. I. WAS. PREPARED. So it will come as no surprise at all to you, gentle reader, that when I arrived in New Orleans late Sunday night after a delightful weekend in Portland (where I first learned of vegan Alaskan reindeer sausage, but that’s another story for another day), my suitcase was nowhere to be found. The good people at United had apparently felt that where my suitcase REALLY wanted to go was Chicago, where it could stroll down Michigan Avenue, take in the Art Institute, and perhaps enjoy some deep-dish pizza at Giordano’s. To say I was beside myself would not begin to cover it. It was now 10:00 at night, and I had to be at the Hotel Monteleone the following morning at 9:30 for the banquet. How was I possibly going to find a suit and have it fitted by then? Although I DID in fact go to Walmart, their selection of quality men’s formalwear was surprisingly poor. I managed to find some shaving cream and a pair of socks, but basically, I told myself as I looked in the smudged and blurry mirror, what you see is what you get. In the end, I simply apologized to everyone the next day for being “a little underdressed.” I had at least shaved, brushed all of my teeth, and I had even combed my hair, thanks to a quick stop at the liquor store on my way to the Monteleone. Because this is New Orleans, and I knew that the liquor store would be open in the morning. And sell combs. The Tribute to the Classical Arts banquet was, as always, a lovely affair, and it was wonderful to see just about everyone I knew in New Orleans there, including my Freedom Ride cast, my colleagues at Xavier, the good folks from Musaica, and my new friend Kathleen Westfall, who will be putting on a production of my opera An Embarrassing Position this summer with the Ninth Ward Opera Company. Seated at my table were Karen Kern and Joycelyn Reynolds from the Arts Council of New Orleans, who generously sponsored our upcoming showcases, and even more serendipitously, Dave Hurlbert from the Marigny Opera House, who graciously offered the use of this astonishing new venue for our performances. (Needless to say, we responded immediately and enthusiastically!) Dennis Assaf from the Jefferson Performing Arts Society announced that he would be presenting the full production of Freedom Ride next year, I took the microphone and gave a quick set-up for the aria we were presenting, and of course Dara and Wilfred performed beautifully. And…well, probably that’s all that really matters. I’m not sure if there is a moral to this story. Maybe it has something to do with bringing a garment bag as a carry-on. Or maybe it has to do with not judging people on how they look or how they dress. They could be having a rough time, or they could have just flown United. 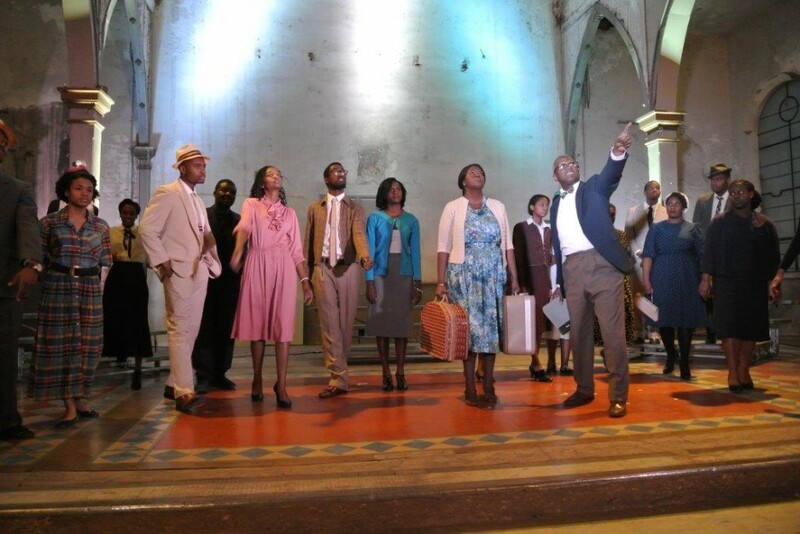 Our next performances are Friday and Saturday, March 22nd and 23rd, at the Marigny Opera House. I’ll probably be wearing a suit and tie. But you—we’ll be very happy to see you in the audience, whatever you have on. And Red Sox fans are especially welcome!